Some time certainly has gotten away since last seeing a distinctly original release featured here, from New York City based hip-hop artist, Tim Margolin, known behind the microphone as I am TIM. Starting out an impression of someone’s return with mention of aches and pain might seem a bit misguided or detrimental. However, in a way, this excerpt from the untitled cut, “Track 5,” off I am TIM’s debut full length album, Sun Shine Through (Made Jour Label 2018), quite shrewdly embodies the album as a whole. Much like the lack of a separate song title and the aforementioned mid-song verse, Sun Shine Through embraces the vagueness of a topic such as personal pain and makes a concerted effort to offer an acknowledgement of uncomfortable circumstances head on. Margolin indeed tackles personal pain front and center on this eight track outing. The album’s title, Sun Shine Through, is in part a reference to a quote by the poet Rumi, who once said, “The wound is the place where the light enters you.” Thinking back on the record’s primary focus, I am TIM says, “I think this album might be made mostly of light and wounds.” Retaining the same character of realistic, open narration that I am TIM showed through a single like “April Rain” back in 2016, the urban wordsmith has re-emerged with no less intent toward telling people real stories by way of idiosyncratic specifics, while also being unafraid of this kind of un-airbrushed honesty – as opposed to crafting a set of verses around a personal experience in a ‘based on a true story’ kind of fashion – might sound in a song – even if that means leaving a track without a proper title because one simply doesn’t fit. 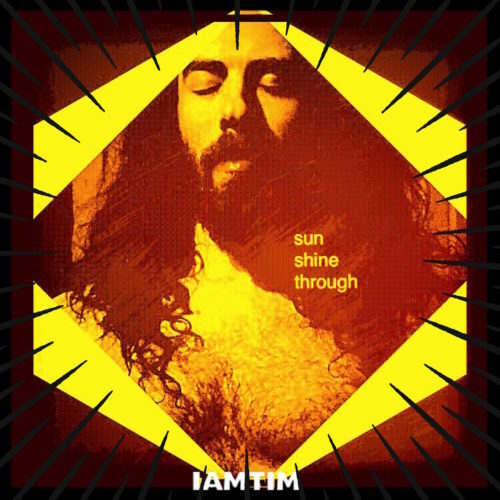 One of the prominent ways Sun Shine Through expands upon I am TIM’s existent relationship with lyrics and transparency is in its display of increasingly vulnerable disclosure. Though the rapper could have opted to use his established strengths of articulation and elocution alone to drive the musicianship of the record, I am TIM elects to also use this opportunity to share a more multi-sided picture that is less rose-colored or guaranteed success and more interim struggle or uncertainty working toward personal resolution. “Remains,” touches on the idea of an unsettled spirit within a smooth musical arrangement, thus making its message easier to process (All I ever wanted was something to put it on the line for / Uplift your heavy soul until it feels light / against the darkest parts learn how to shine real bright / Fuse once lit reignite). The sheer brightness of a solo horn is heard only at a distance from the front and center lyrics – the latter somehow sounding graceful and soft against the punctuation of I am TIM’s delivery. The coexistence and heavy blending of smooth instrument sounds, as well as more flowing vocals, with the album’s more somber content, is yet another way I am TIM has fleshed out the artistic and creative tools at his disposal for this effort. While rappers have the choice to keep their backing support minimal or even nonexistent if they so choose, Sun Shine Through channels quite a few different kinds of musical aesthetics in different tracks. The opening, “Stay Tru,” starts on a fairly instrumentally restrained path. However, for what is selected – minimalistic electronic drum beats, light organ, and some light touches of melodic synthesized notes – when combined with I am TIM’s slow-paced singing, which occasionally crosses into sounding like emotive pleading at the ends of words, thoughts of James Blake and his somber melodic dubstep come to mind fairly easily. Turning on a dime both melodically and lyrically with “You Know,” I am TIM picks up the tempo and listeners are immediately greeted with an electric guitar tone that almost feels out of place with Margolin’s usual fare because of the former’s very loud and blunt quality – one that sounds like it would be more at home in any blues rock band. It doesn’t take long to adjust though and when paired with a quicker backing drum beat, a slightly more sprightly narrative (You know I love you way more than I ought to…I can’t get back to you / more than I ought to), and Margolin alternating between louder declarations and an almost whisper-level dynamic against the nearly solo’ed guitar, the track takes on a funky soul-style quality sure to fit well with the approaching summer season. The minimal arrangements chosen by Margolin leave little in the room for compositional interpretation (the tone warped orchestral aesthetic of “So Far” the notable exception) but conversely, instruments are given much more prominent emphasis and a greater sense of responsibility where the shaping of the song is concerned. The prominence of the syncopated Rhodes part in “No Strings,” works with I am TIM’s mostly sung but occasionally spoken and more assertive delivery, in a way that gives the song a more straightforward rhythm and blues vibe. As the album continues on, it becomes exciting, not just to see what story I am TIM will dare to tell, but also what role of importance he will give his own voice against the sounds, rhythms and dynamics of each track. There’s a humbleness to it all. Play Sun Shine Through once and listen for the narratives. Play it through again and suddenly the experience might become less about the words and more about the sheer sonic variety surrounding them from beginning to end. Still, that’s not to say that this record sounds musically scattered or lost. Some form of bass, keys, and electronic drums generally steers the non-vocal sounds. Yet, if an album can be played through just for exploration of the interplay between vocal and instrumental parts, then what I am TIM is demonstrating is an appreciation for the subtle power of balancing the stylizing power of mixing, production, and his own performative technique – understating the strength in what all of that working together can do to widen the artistic potential of an album in the face of opting to not drastically alter one’s voice or, deliberately write a vocal part counter to one’s typical style of rapping. In the end, Sun Shine Through is an album that was thoughtfully developed in all of its creative aspects: lyrical, performative, and instrumental. It provides many kinds of artistic substance without aiming to overload listeners and without losing its own way. Though I am TIM said that Frank Ocean and his sophomore album, Blonde (independent, 2016) helped to inspire Sun Shine Through, the New York rapper also said he “was[n’t] inspired to try to make [his own] version of ‘Blonde.” Rather, I am TIM ran with this inspiration, “think[ing] you can listen to “Blonde” from a variety of distances and vantage points, the melodies, the vibrations, the stories, the songs, the feelings and memories and vows and regrets” and in this regard, where I am TIM undertaking his first full album is concerned, he connected with his source of inspiration perfectly. “I was inspired to be myself. and to record that – to get in a zone, stay there, and to make whatever it is that I can make.” – I am TIM. Sun Shine Through is available now through iTunes and Amazon. Find it streaming through Spotify and SoundCloud. The album was mixed and mastered by Nicholas Gardino of New Royalty Records in Deer Park, NY. I am TIM will be performing at the Brickhouse Brewery in support of Sun Shine Through, one week from today. Full show details are below.